A bill that would allow motorcyclists in Tennessee to lane split has been introduced, with the American Motorcyclist Association expressing its support. Tennessee H.B. 1102, introduced by state Rep. Timothy Hill (R-Blountville), would allow motorcyclists to ride between lanes of vehicles when traffic is moving at 45 mph or less. Motorcyclists would not be allowed to exceed posted speed limits, nor deploy the lane-splitting technique in school zones. "Research and evidence suggest that lane splitting may reduce a motorcyclist's exposure to collisions, which is why the AMA supports H.B. 1102" said Wayne Allard, AMA vice president of government relations. "Motorcyclists' safety is our utmost priority." In the United States, lane splitting is technically only permitted in the state of California, though it is also frequently done by riders in certain East Coast states. However, perhaps because of ever-worsening traffic congestion, more and more riders in other states are calling upon their legislators to remove the legal barriers against lane splitting. Just within the last month, laws that would allow lane splitting in some form have been introduced in Washington and Texas. 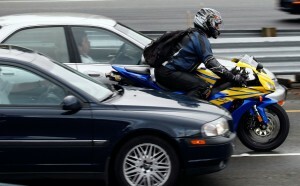 According to the AMA, in addition to the reduced risk of suffering a rear-end collision, other benefits to lane splitting include: an increase in conspicuity because the motorcyclist is moving relative to other traffic; a reduction in motorcyclist fatigue from constant shifting and braking in stop-and-go traffic; a lessening of the risk for engine damage for air-cooled engines; a reduction in motorcyclists' exposure to ambient heat in the summer and car exhaust year-round due to fewer hours spent in traffic.